[178 Pages Report] Renewable energy is defined as the energy derived from natural sources, such as, sunlight and wind, among others. These sources replenish at a higher rate than they are consumed. As a result, unlike conventional sources, it will not deplete and hence can be reused. Renewable energy sources considered for this study include wind, solar, geothermal, and bio energy. The role of renewables in electricity generation has increased with time. Focus towards reducing air pollution, curbing global warming emissions, and decreasing dependence on coal & other fossil fuels globally are positively influencing the adoption of renewable energy technologies. 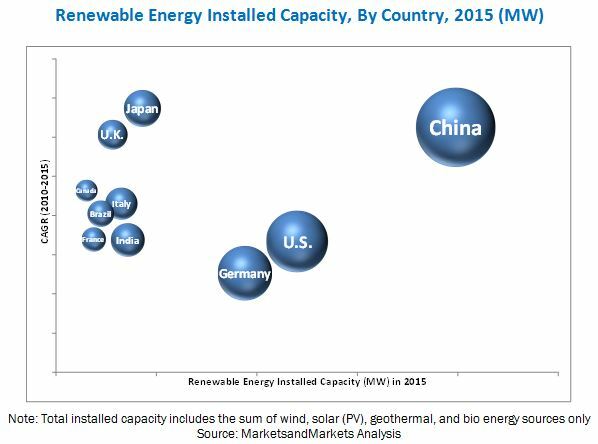 Moreover, various countries such as the U.S., China, and Germany are providing incentives, including feed-in tariff, for power generation from renewable sources. This coupled with the increasing cost competitiveness of renewable energy sources when compared with other conventional power generation sources is also boosting the demand for renewable power generation. This research study involved extensive usage of secondary sources, related research publications, and Government websites (such as EIA, and IRENA, among others) to identify and collect information useful for this technical, market-oriented, and commercial study of renewable energy. The points mentioned below explain the research methodology applied in making this report. The figure given below shows the breakdown of the primaries on the basis of company type, designation, and region, conducted during the research study. Global focus towards reducing air pollution, curbing global warming emissions, and decreasing dependence on coal & other fossil fuels is positively influencing the adoption of renewable energy technologies. Moreover, incentives offered by the governments coupled with increasing cost competitiveness of renewable sources when compared with others of power generation are also boosting the demand for renewable power generation. The report provides insights related to the different renewable energy technologies such as wind, solar, geothermal, and bio energy; their capacity addition from 2011 to 2015; renewable energy targets by 2020; key projects related to major technologies; and the feed-in tariff offered for each technology. The U.S., Canada, Brazil, the U.K., Germany, France, Italy, China, India, and Japan are the countries which have been considered for this study. In terms of renewable energy installation, by technology, wind is a widely present renewable energy source, followed by solar, bio energy, and geothermal. It terms of adoption rate, solar is being widely adopted and deems to be a promising technology in the near future. Countries in North America, especially the U.S., and some major EU nations (such as Germany and France) have strict mandates for renewable energy technology adoption. Meanwhile, certain countries in Asia-Pacific such as China, India, and Japan are also actively involved in meeting the renewable energy targets. Incentives such as feed-in tariff are provided by the governments to enhance renewable energy technology adoption. Some of the leading organizations present in the renewable energy value chain includes Ministry of Environment, Energy and the Sea (France), Ministry of New and Renewable Energy (India), Ontario Power Authority (Canada), Office of Gas & Electricity Markets, U.K. Government (U.K.), Ministry of Economy, Trade and Industry (Japan), Domion Virginia Power (U.S.), Tennessee Valley Authority (U.S.), Los Angeles Department of Water & Power (U.S.), Orcas Power & Light (U.S.), Green Mountain Power (U.S.), and Eugene Water & Electric Board (U.S.), among others. 8.12 Black & Veatch Holding.